Meanwhile, in small bowl, combine all sauce ingredients; mix well. Set aside. Heat oil in large nonstick skillet over medium-high heat until hot. Add zucchini, onion and garlic; cook and stir 2 minutes. Reduce heat to medium-low; stir in corn and sauce mixture. Cook 2 to 4 minutes or until vegetables are crisp-tender and mixture is bubbly and thickened, stirring frequently. 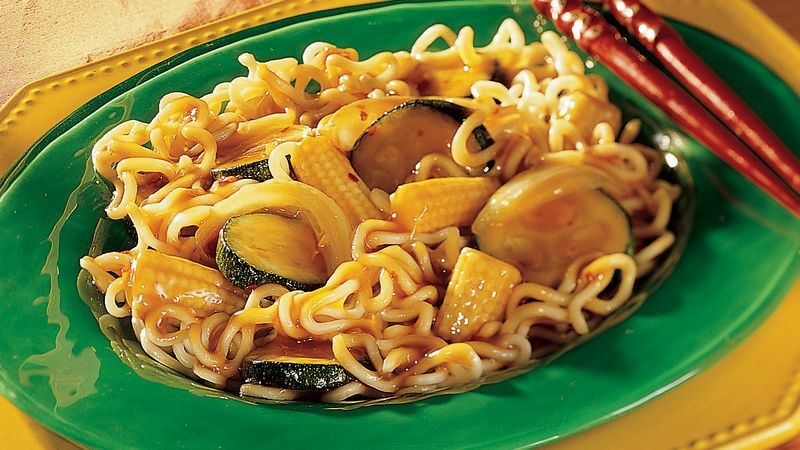 Stir in cooked noodles. Although this recipe does not use the seasoning packet from the ramen soup mix, those following a vegan diet may want to look for the ramen noodle soup mixes that do not contain animal products in the seasoning. Baby corn nuggets taste fresher after the salty brine is rinsed off with cold water.